Art about real-world issues goes in and out of favor with artists. There are always some who preach to the politically correct art-world choir in the recondite grammar of art theory, which generates little resonance outside the white-cube network (not that Goya or Picasso managed to make us better or wiser). Oakland sculptor Cyrus Tilton thus has his work cut out for him. In his view the human race, with its slash-and-burn consumption habits, now unsustainable, is like a Biblical plague of locusts. In “The Cycle” and related insect-themed works, however, he makes a strong, disturbing and funny case — and one that hominids both solitary and gregarious might well consider. (Locusts, in case you need an entomological refresher, are grasshoppers that, stimulated by overcrowding, mutate, changing from solitary browsers to ravening migratory hordes. There is no periodicity to these swarms, as there is with cicadas. Tilton’s entertaining and provocative show is comprised of three elements. “The Cycle” is a sculptural installation composed of almost five hundred handmade mixed-media locusts, all pretty much the same even given that a host of assistants joined in the enterprise. They’re installed all over the upstairs gallery: on walls, skylights, and on the floor underfoot, and, most dramatically, suspended in flying postures from fishing line, like puppets, and apparently tossed by the breeze — though activated in fact by a motorized rotating camshaft that causes the bamboo grid from which they hang to undulate. It’s a special effect of these laborious, low-tech animatronics. The effect is fascinating and hypnotic, alarming and charming in equal parts to kids and adults, especially with the twittering/chirping sounds made by the mechanism. Another creepy-crawly crowd pleaser is ”The Lovers,” in the street-level part of the gallery. It’s a pair of mating locusts, larger than human scale, made from welded steel covered with beeswax/damar-impregnated muslin. In the sly words of short-story writer John Collier, who was describing animated mannequins, these outsize insects are “complete in every particular.” Finally, there are “Potential” pieces, which may be unjustly overlooked because of their spectacular exhibition-mates. 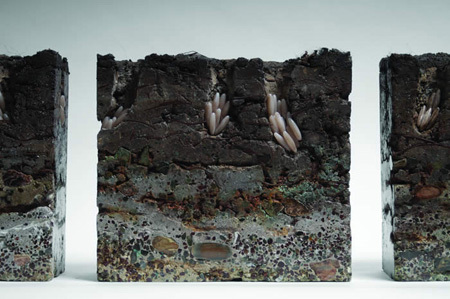 These are square-format mixed-media reliefs that are wall-mounted like paintings, but fabricated like assemblages from many components — and they appear to be cross-sections of layered earth in which locust ovipositors have dug tunnels and secreted tiny clutches of eggs. They’re tours de force of crafstmanship, and would look splendid in any museum or great room or former nursery (once the juveniles have completed their final molt and flown away).